The novels of John Blackburn are legendary, and Centipede Press now presents For Fear of Little Men, one of Blackburn’s most tightly plotted novels, in a new edition with an introduction by John Pelan. Combine this order with the sixth title in the series, Our Lady of Pain. So wrote William Allingham in his classic poem, a chilling look at the fairy folk. John Blackburn has taken the poem as a cue to author what in the opinion of many (including Centipede Press editor John Pelan), is his finest single work. There are places in the world that are seemingly infested by a genius loci or worse. Places where nothing lives and nothing grows; for those that foolishly investigate such sites, death, or worse, awaits. There is such a place in North Wales, shunned by locals for three thousand years. Something is there, something old and evil. Is it this something that is responsible for events taking place across the world? A breakout of food poisoning, the death of a Soviet defector at the Berlin Wall, crazed outbreaks of violence throughout the U.K.? It’s up to Sir Marcus Levin and his wife Tania to undo the Gordian Knot of this riddle while there’s still time… Will they succeed against this seemingly ancient and unstoppable evil? The denouement makes this one of the finest thrillers ever written. Centipede Press is proud to release this fifth volume in our series of John F. Blackburn’s greatest works. Originally published in 1972, For Fear of Little Men is one of Blackburn’s most respected novels and is now presented in a handsome hardcover format. Limited to 200 copies, signed by both introducer John Pelan and legendary cover artist Gahan Wilson, you can order this and the next volume, Our Lady of Pain, and receive matching numbers! 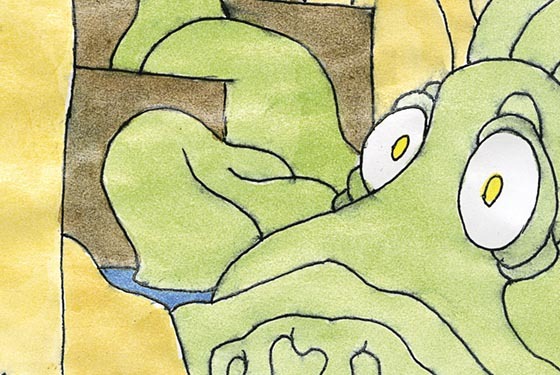 Limited to 200 copies, each signed by John Pelan and Gahan Wilson. Family-approved facsimile signature by JohnBlackburn. New introduction by John Pelan. Full Dutch cloth with blind stamping on front board. Ribbon marker, head and tail bands.